As mentioned for a table, a form can display with a tab or a title bar. In the Form View or in Design View, a form's top section displays an icon . Tabbed Documents or Overlapped Windows? The middle section of the title bar is actually referred to as the title bar. It can be used to change the view of the form after right-clicking it. The caption of a form is text that displays on the title bar or the tab of the form. By default, the caption of a form is its name. To specify or change the caption of a form, access its Property Sheet and, in the Format or the All tab, click Caption and type the desired string. On the Ribbon, click Home. If you display a form as overlapped, it would be equipped with three system buttons , or , . The group of these buttons is called the Control Box. If you do not want these system buttons at all, access the Property Sheet of the form and set the Control Box Boolean property to No from its Yes default value. The presence of the form's system icon is partly controlled by the Control Box property of a form. The borders of a form specify where a form starts and where it ends. If a database is configured to show overlapped windows, the borders of a form are controlled using the Border Style property. If you set it to None, the form would appear without borders. Although two sections are added, you can reduce one completely so it would not appear to the user. This means that you can keep one section and hide the other. If you create a form using the Form Wizard, both the header and the footer sections are added but the footer section is completely reduced so it would not appear to the user. If you want to display it to the user, you must expand it. A form can also be equipped with two Page Header and Page Footer sections. To get them, right-click the middle of the form and click Page Header/Footer. A form is equipped with dividing horizontal lines used to visually separate sections of a form. To equip a form with dividing lines, add a header and a footer sections. The presence or absence of the horizontal lines is controlled by the Boolean Dividing Lines property. 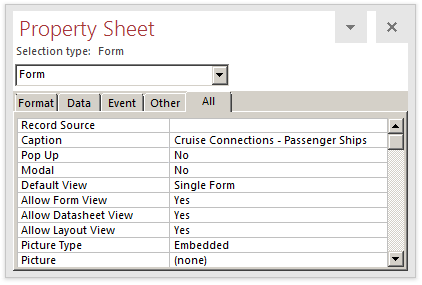 The width of a form is controlled by the Width field in the Properties Sheet. The CruiseShips form should be displaying in Design View. The height of a form is controlled by its sections. Each section has a Height field in the Property Sheet. Then click and drag left, right, up, down, or diagonally. As mentioned already, when a form displays in Form View, if its content is wider or taller than the current size can show, the form would be equipped with scroll bars. If you (in fact the user) want to resize the form enough to show its whole content, on the Ribbon, click Home. In the Window section, click Size To Fit Form. 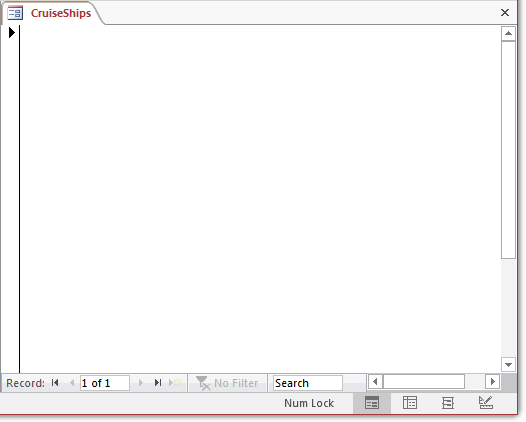 When you open a form from the Navigation Pane, it is positioned from the top-left corner of Microsoft Access. If you want the form to be automatically centered, access its Property Sheet and, in the Format or the All tab, set its Auto Center Boolean property to Yes from its default No value. To support background colors, when you select an object such as a form or a report, the Ribbon provides a button labeled Shape Fill. 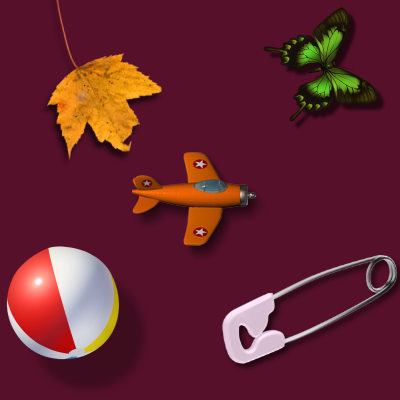 Use it to set a color to the object. The Browse button allows you to select or create a color. As another technique, you can provide the value of a color as a hexadecimal number. For example, the red color is #FF0000, the blue color is #0000FF, and so on. The Occupancies form should still be displaying in Design View. 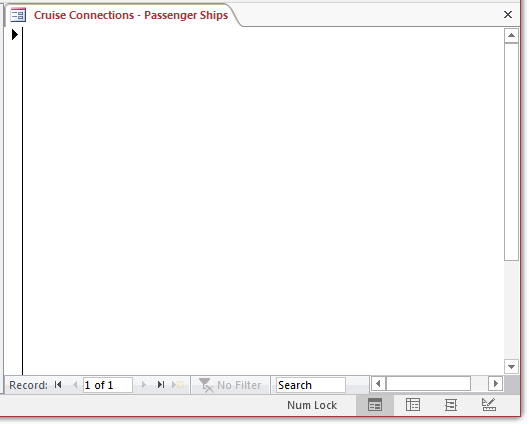 The Cruise1 database should still be opened with the CruiseShips form in Design View. 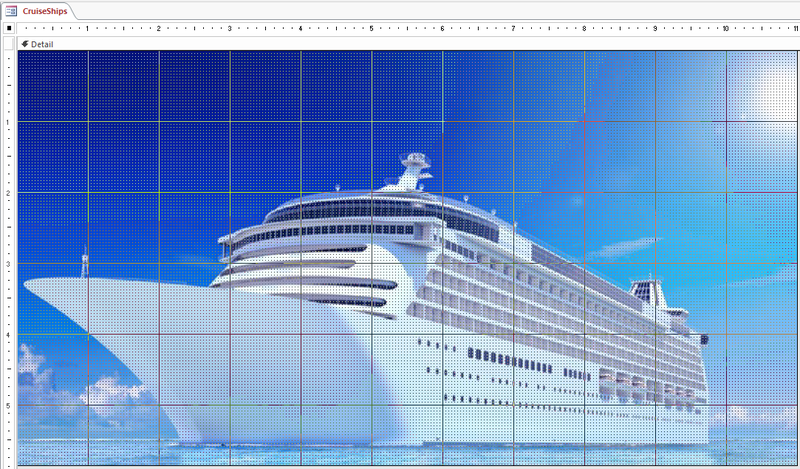 The position of the background picture is controlled by the Picture Alignment property whose default value is Center. Its other values are: Top Left, Top Right, Center and Form Center, Bottom Left, and Bottom Right. Zooming or stretching is controlled by the Picture Size Mode property. Its values are Clip, Stretch, Stretch Horizontal, Stretch Vertical, and Zoom.